Ronny Deila says he will have one eye on Dundee United against Aberdeen as he waits to hear if Celtic will be crowned Scottish Premiership champions. The league leaders moved 11 points clear of the Dons with a 5-0 win over Dundee in a one-sided Friday night match at Celtic Park. Should Derek McInnes' side fail to win in Tayside, Celtic will be confirmed as league winners with three games to play. "We'll follow the game, of course. It's tough to play against Dundee United away," Deila told BBC Scotland. Celtic travel to play Aberdeen next weekend and could win the league there instead should Aberdeen keep the title race going with victory at Tannadice. "It's a chance that everything could be ready tomorrow," said Deila. "But we have put ourselves in a good position. "If Aberdeen continue to win like they have done then we have to do it up there." Leigh Griffiths and Scott Brown scored in the first half against Dundee before Kris Commons, James Forrest and Nir Bitton increased the damage. 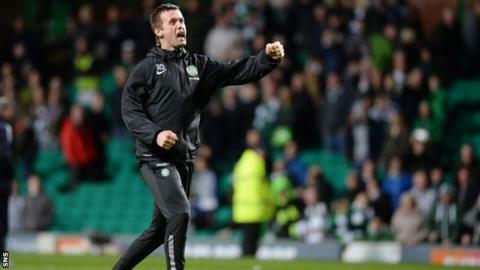 Deila said: "It was a good performance so I'm happy for that. I think the players were excellent today. "We had full control of the game. We kept a clean sheet which we have done so many times this season. "We've only conceded 17 goals in 35 games, and that's very high, maybe the best in Europe." Dundee manager Paul Hartley saw his team lose to Celtic for the second time in nine days in a game where they rarely troubled opposition goalkeeper Craig Gordon. Hartley said: "When you come to Celtic you try and stay in the game as long as you can. You try and have a strong mentality. "But tonight we faced a very good Celtic team. "I think we did okay for that first 30 minutes, the first goal's always vital. But you saw the class that they've got. "Two of our key players were missing tonight and a lot of players were carrying knocks. We had a patched-up team." Dundee still have slim hopes of qualifying for next season's Europa League, trailing fourth-placed St Johnstone by seven points. "The next three games are vital for us and we've got to get as many points as we can. "We've got to look at things over the next few weeks; how can we get better, how can we improve on this year, because we've got to be better next year."